Forensic Detective | Master the technique of finger printing! Just like a real detective! Learn how to take the finger prints of your friends and family, just like on CSI! 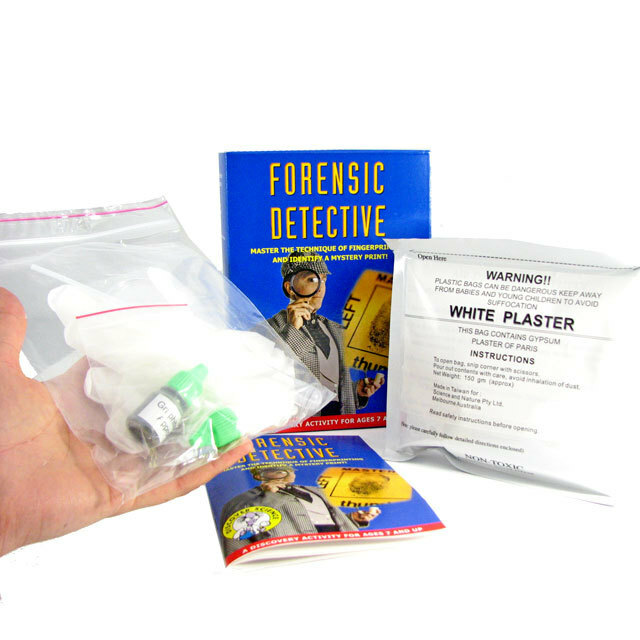 The Forensic Detective kit will teach you how to use plaster to take and identify foot prints, and learn about paper chromatography by using blotting papers to separate out the constituent colours of felt tip markers. Take casts of animal foot prints in your garden to see if you can identify who they belong to. What type of animal is present in your back yard? Note: Also required but not included are felt tip markers (different brands are required for the chromatography experiment). A discovery activity for children ages 7 and up.